RUSH: We’re gonna go to Plymouth Meeting, Pennsylvania. Mike, thank you for the call, sir. How are you? 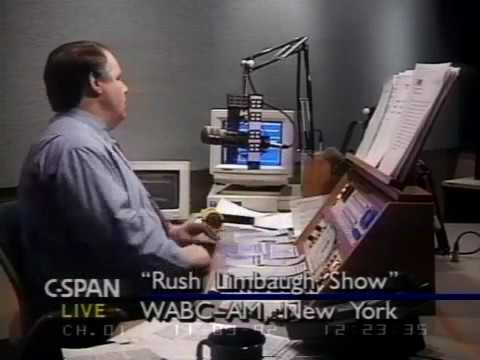 CALLER: Hey, Rush! It’s Mike from Plymouth Meeting. Big congratulations and mega dittos! CALLER: I caught you on your very first broadcast on radio station 770. My wife and I were on our way to the Jersey Shore. I heard you talkin’, and I said to my wife, “What did he say his name was?” And she said, “I think he said ‘Rush. '” And I said, “Man, I don’t know who he is, but I sure like what he’s saying. He’s saying what I’m thinkin’,” and I’ve been listening ever since. RUSH: Well, I appreciate that. You know right where you were, too, when you first heard the show. CALLER: Rush, almost to the exact exit on the Jersey Turnpike on my way to the Jersey Shore listening to radio station 770; then you switched it to Philadelphia 96.5. I listened to you through all that static and lousy connections for years. (chuckling) Love you, man. Love you! RUSH: (laughing) I appreciate it. I really do. I think about my first day at WABC, Studio 8X. Remember Studio 8X? I’m walking in there, and it’s my first day. I’m on my way to spending my first month in New York at a hotel. The moving van lost the furniture for two months. It was at Le Parker Meridien. I walked in and it was a heatwave. It was unrelenting. The rain felt like a hot shower. I have never experienced a hotter summer in my life than the first six weeks I was in New York in 1988. I walked into WABC, and I knew — I knew — that many in management wished the deal had not been made that had me there to do these two free hours on WABC. But yet it was WABC, it was New York, it was the pinnacle. It was such a gamut of emotions that I went through. I’ll never forget any of it. RUSH: Well, that’s it for the look-back remembrances here on our 29th year, starting our 30th. Thirty years at any job is a big deal. Thirty years in this business in the same job? Maybe five people have done it. Maybe three. I don’t know.